Board management software provides a workspace for board members, chief executives, and other professionals in charge to stay organized, make timely decisions, and plan progress in a cohesive manner. These collaborative tools allow access to agendas, documents, notes, calendars, and contacts that can be used to inform and fortify the corporate meeting process. Files can be uploaded within the workspaces, and users can then be assigned access according to their roles and clearance levels. These tools are most commonly executed among leadership teams, whether that be a parent committee or board of a large corporation. Board management software can be used alongside structured or team collaboration tools that are open to involvement from employees or participants at varying levels of authority. Board Management reviews by real, verified users. Find unbiased ratings on user satisfaction, features, and price based on the most reviews available anywhere. Passageways' OnBoard Board Portal is next generation board portal meeting software, engineered to drive good governance and improve meeting outcomes. A board portal with the tools every director needs to focus on strategy during their next meeting. OnBoard makes meetings more than operational presentations, it turns them into strategic working sessions. With OnBoard, meetings become more productive, board book access becomes amazingly intuitive, archives are readily accessible, votes can easily be taken, and minutes entered. You have time to devote to thoughtful deliberations. OnBoard offer gold standard of Cloud Security with OnBoard: Microsoft Azure. OnBoard offers world-class security, full disaster recovery, active geo-replication, and compliant with a broad range of international information security standards, including but not limited to: GLBA, FERPA, HIPAA, FISMA ISO 27001/27002, SOC1, SOC2, SOC 3 1000s of directors from growing startups to Fortune 1000 organizations use OnBoard to drive better governance. Start a no-strings, full-feature, 30-day free trial. BoardPaq board portal and board management software has empowered boards to be great since 2011. Trusted by over 12,000 Boards and Committees, BoardPaq is an affordable, easy-to-use, secure board portal on iOS, Windows and Web for planning, running and managing paperless board, leadership and committee meetings. BoardPaq has an Agenda and Minutes Builder to assist administrators and board secretaries. BoardPaq is the leading board management SaaS vendor for small-medium enterprises including for-profit, nonprofit, education and government organizations. Headquartered in St. Louis, MO, the BoardPaq management team has more than 70 years of experience in the IT industry. Diligent Boards is a tool for the preparation, distribution and review of board meeting materials. Diligent Boards is used by 100,000+ directors and senior executives at 3,500+ companies in 60+ countries. This includes 40% of both the Fortune 1000 and FTSE 100. Diligent Boards is designed to be a flexible tool, with a robust set of features that are designed to reflect how board members, executives, and administrative teams actually work. Diligent also offers several capabilities that are not found on other tools, including Preview to Updates, Note Saver, Smart Sync, and Quick Build. Award winning service is provided to all Diligent Boards users; Diligent provides unlimited training and support. 24/7/365 phone support is available from Diligent staff in New York, London and New Zealand. 100% of calls are answered by a person – not voicemail – and according to the vendor, 98% of issues are resolved on the first call. This ensures that users always have secure access to critical materials. Diligent has established a high standard of information security controls, both internally and through independent external validation. This includes SSAE 16/ ISAE 3402 (SOC 1 Type 2) service organization annual audit of controls and ISO 27001 Certification since 2014, as well as many others. 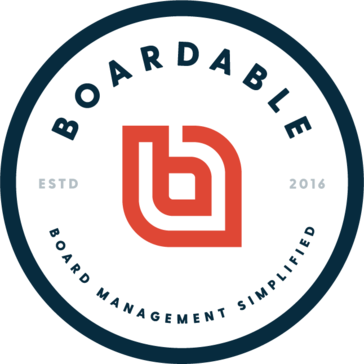 Boardable empowers you to better engage your nonprofit boards and committees. We know the frustration you feel (and the hours you lose) just from organizing a meeting via email, phone, and text. We’ve lived it. We’re from the nonprofit world, too. After looking around for the right tool but not finding it, we decided to build it. Boardable centralizes all board content and communication, automates routine tasks, integrates with existing platforms and streamlines common workflows. 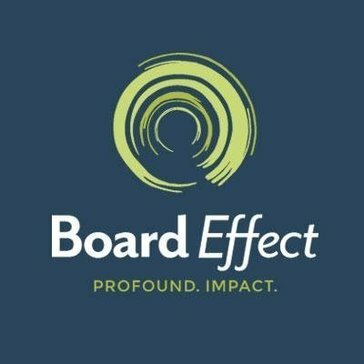 BoardEffect is a board portal software designed to drive efficiency, effectiveness & engagement, allowing easy management of board information while enhacing performance. Better meetings. Easier board management. Convene, the board management software used to compile and distribute papers, generate minutes and, carry forward actions items for meetings. Award-winning usability makes it the choice for listed companies, SME, banks, governments, healthcare & non-profits in more than 70 countries. Developed by Azeus Systems, with over 25 years of experience in IT development, Convene is a certified secure platform for your organization. Available on-cloud and on-premise for Windows, Mac OS X, iOS and Android. CCH Company Secretarial is a comprehensive cloud solution for managing all company secretarial requirements. ARALOC provides Cross Platform / Multi-Device support, digital rights management (DRM), and remote content management technology to secure confidential and proprietary content from leakage, piracy and misuse, without impacting collaboration between stakeholders. BlueSky Meeting Software is a board management software for creating, coordinating and conducting board meetings. BoardMaps is a decision management system for boards and executive teams designed to ensure strategic and tactical alignment before, during and after business meetings. Boardvantage offers purpose-built tools for boards and leadership. The DiliTrust Exec’s board portal provides an efficient and secure method for board members and executives to collaborate ideas and information. Thus, organizations can implement board recommendations swiftly while ensuring a high level of corporate governance. Data security is the #1 priority for DiliTrust Exec and the whole service is ISO 27001 certified. Directors Desk is an online board portal designed to provide public, private, and non-profit boards and leadership teams with greater governance management, engagement and insight throughout the organization. eSCRIBE provides endtoend, cloudbased meeting management solutions that help councils, board and committee members and staff, boost transparency, stakeholder participation and efficiency. It's more than agenda management, it's meeting management, and that's better. A meeting platform that integrates with your Outlook and is accessible on your mobile device. Digital meeting management will improve meeting outcomes and productivity. It can help lead digital transformation in your business by harnessing the power of your SharePoint or Office 365 account and integrating it with your Outlook calendar. MeetingSquared has an interactive agenda to keep you on track and digital actions and notes to build in accountability and followup. Nasdaq Boardvantage makes every aspect of board meetings and collaboration among directors and leadership teams simpler and easier to manage. The platform's intuitive interface and robust security features allow directors and leadership teams to work together far more efficiently, productively and strategically. NovusAGENDA is electronic meeting management software designed to help create, approve and track items for past and future board meetings. Admincontrol offers web-based solutions as well as a separate iPad and iPhone app for secure collaboration and easy sharing of documents in business processes such as board and management work, due diligence, capital injections and stock exchange listings. BLISS (Board Leaders Integrated Software Solution) is a cloud hosted software for company secretaries and is designed to be an e-repository for secretarial records and provide timely alerts to ensure compliance and good corporate governance. BoardBookit is a secure board portal software, architected by corporate governance professionals to transform the way companies engage and collaborate with their board. By providing a unified solution for preparing and managing board meetings, file sharing, electronic voting, eSignatures and more, companies increase efficiency and save time. Trusted by more than 10,000 board members worldwide, BoardBookit ensures a streamlined and persistent partnership between organization executives and their board of directors. Board Director is a board portal designed to make communication between the Management team and the Board easier and more efficient, a central location for all vital financial, legal, policy, and governance documents, and improved collaboration between directors, staff, and guests. BoardDocs nextgeneration, cloudbased services alleviate the enormous task of assembling, printing, distributing and revising board packets. Axar Digital provides paperless board meeting software for simplifying board meetings and routine tasks associated with meeting development. Board Intelligence enables your board to make smart decisions, driving better outcomes for shareholders, employees and society. Board Secretaries can plan effective agendas, Management can write concise reports, and Board Directors can read all their board packs. All in one ultra-secure place. It’s an end-to-end software designed to address poor quality board information, and help your board see what matters. Board Management is a Software designed for board of directors and board members. BoardMax is a web-based board portal designed to boost board member engagement, drive good governance and simplify board administration. BoardPAC, is an award-winning paperless Board Meeting governance automation software, which fosters an easy to use and convenient platform for conducting board meetings and other high level senior management meetings via iPad & tablets. With both on-premise and cloud storage options, supported across platform that includes Android, iOS, Mac and Windows. BoardPAC is offered with the highest data security management certification by ISO 27001 and with unlimited 24x7 support and training. BoardPacks is a board portal software tool designed to improve productivity. BoardPad is the industry-leading meeting and document collaboration solution that transforms directors’ devices into highly secure digital board and meetings packs. Accessible on a range of platforms, with hosted and self-hosted options available, BoardPad gives directors access to their most time-sensitive and confidential information online and offline. Board Papers is a board management software designed to create agendas, control, annotate, and sign documents using touchscreen devices. BoardPortal Plus is a board management software that is an easy-to-use, comprehensive portal for boards with signatures, email, board books, governance assessments, communication and learning resources. boardPro makes easy to use software for board workflows, responsibilities and documents. BoardSpace is a solution helps boards of directors and managers of condos, HOAs, and non-profits automate and simplify the board management. BoardSpot lets nonprofits fully leverage the expertise of their board members, and staff, by providing tools to simplify management of crucial documents, notes, agendas, and attendance. BoardTRAC offers secure online board portal software with customised applications to conduct meetings with full access to board documents. BoardWorks is a board management software that provides document approvals, integrated document annotation, electronic signatures, survey and voting modules. Brainloop BoardRoom - the digital platform for the professionalization of board and committee communication in a demanding compliance environment. Brainloop BoardSuite - The all-in-one platform for all board and committee communication, ensuring not only the creation and distribution of meeting records, but also their secure and compliant delivery. BoardSync offers Agenda and Meeting Management solutions. CUBoardMembers provides online Board Packets, built-in video conferencing, private discussion boards, online Board voting, automatic tracking of Credit Union Policies, compliance monitoring, and many other features. The system was designed specifically for Credit Union Boards and addresses issues that are unique to the Credit Union industry as well as issues shared by all Boards. Decisions is a board management platform designed to save time in planning and management of meetings, support leaders in running a better team decision making process and give leaders an instant overview of progress on all decisions and action items throughout the organization. Decision Time Meetings is the paperless meeting solution that simplifies formal meeting management for organisers, makes participants more effective and reduces costs. Dess Board Portal is asoftware solution that allows the boards of companies to collaborate with ease and leads to effective and efficient board meetings. Directorpoint is comprehensive board software built to simplify, streamline and enhance the way your board communicates. It features a “One View” interface that places all the information every member of the board need and demand right at their fingertips. Directorpoint is loaded with premium tools such as Votes, Surveys, Committees, RSVPs, and Annotations to mention a few. Board administrators find it easy to prepare for any meeting with their fellow board members. The software lets them create board books containing hundred of pages in just seconds, not minutes, hours, or days. Editing documents in your board books is a breeze. You can make changes to your documents without needing to reprint or resend the board books. Simply put, Directorpoint makes every boardroom meeting productive and more time efficient. eConvene is a paperless online board meeting management software. Global Governance’s SCM platform is the SaaS product on the market to offer a broad suite of corporate governance tools and services that can be customized based on an organization’s needs and resources. Global Governance Advisors presents the emPower platform, the first cloud solution that includes board evaluations, scorecards and streaming video, maximizes the incentive plans for senior management, and improves oversight of stakeholder engagement activity while ensuring corporate governance, regulatory compliance and risk mitigation. Why Use Board Management Software? Who Uses Board Management Software? Board management tools, also called board portals, are used to organize board meetings and crowdsource executive opinions and ideas on financial, directional, and product decisions within a company. Tools with survey features make it simple to gather various types of feedback without the pressure of delivering it in front of a crowd or within the timeline of the meetings. These surveys can help gather thoughts on how a meeting was run, gauge unanimity on decisions that were made, and allow employees an outlet where their input will be heard. Board management tools simplify aspects of managerial meetings, the planning of which requires communication. Some tools will integrate with a team’s calendar, email, and contact settings to make this planning process easier. The solution can ensure those required at a meeting receive email notifications about possible meeting times and automatically send out calendar events reflecting the final decision. Search through content to locate former agendas, documents, comments, etc. Company leadership can make or break a company. One of the most straightforward methods to achieve strong company leadership is to guarantee that the top of a company is efficient with their time and has relevant materials exactly when they need them, including content like briefings and internal data. Centralized Information Hub — Searching for documents across disparate content management systems is frustrating for anyone. The cost of the time spent looking for shareable documents is much higher in the context of executive board meetings. Board management software offers a singular, integrated portal where directors can find all the materials they need. Meeting Management — Meetings without direction waste valuable time and energy. Executives don’t have time to spare, so ensuring that meetings are efficient and informative is imperative to the success of an organization or company. Board management tools provide features available before, during, and after meetings that keep everyone on track and on topic. This can include features such as meeting agendas, note-taking, and document viewers and editors that can be accessed from one board portal. Remote Collaboration — Board members cannot always be in the same place at the same time and are sometimes dispersed into locations that do not have quality internet connections. For this reason, a team of executives might prefer a board management tool that allows users to view documents, agendas, notes, and more offline. In this way, a CEO who cannot physically attend a meeting could still look at the meeting’s agenda on their tablet on an airplane. Preparedness — Many board management tools allot storage space for the various documents and board materials that teams require in meetings. These meeting documents can be uploaded prior to meetings so team members are able to consult them in advance to prepare questions or comments. Many tools also offer version control for these files and documents so there’s no confusion as to the most recently updated version. As the name implies, board management tools are intended for executive boards. However, any high-level group within an organization can find use in board management tools since their base features have broad applicability to any meeting setting. This can include middle management within a company, such as managers or coordinators who meet with one another often. However, the base functions of the software will look the same regardless of what level of management is handling it. Some board management software is intended specifically or has functions tailored for specific types of executive boards, most notably those for nonprofit organizations. Extra features could provide lists of donors and integrate with other types of nonprofit software. Board meetings will look different across disciplines, and board management software can offer specialized features based on use case. It’s crucial for a board to ensure that board portal software provide all the discipline-specific features they require if they want an effective solution. Document Storage and Sharing — Documents can be shared and stored within most board management portals. These documents can be pulled from an outside content management system or uploaded and stored in the portal itself. Documentation can then be viewed by board members in the portal or attached to agendas and meeting notes later. Meeting Agenda — One of the staple features of board management software is meeting agenda creation. An agenda can be set and viewed by board members before the meeting takes place, which can help them stay on track. Documents related to meeting talking points can also be attached to an agenda for easy access. Meeting Notes — It can be inconvenient to move to a separate application to take notes during a meeting, so many board management tools provide note-taking capability. Notes can either be private or shared with other members in the portal. Some board management tools will even automate the note-taking process and send meeting minutes to members once a meeting has ended. Surveys — Surveys are an excellent tool to streamline decision-making during a meeting, and board management solutions will sometimes provide a survey function within their offering. Survey results can be attached to a meeting’s minutes or stored elsewhere in the portal to be referred to later. Comments and Annotations — Users can record notes publicly or privately throughout the meeting to be shared with team members or attached to documents. These notes help users remember details of the meeting and can be used later for reference. These features are helpful for team members who like to have a record of their individual perception of meeting details. Offline Availability — For board teams that are frequently able to gather in full, offline capabilities might not matter as much. For those that are often operating from separate corners of the globe, this feature could help keep members in the loop. Integrations — Some board management solutions won’t offer some of the features listed here and instead integrate with outside software to provide them. This can actually be beneficial in the case of calendars or content management systems, since most businesses already have these in place. Structured Collaboration — Board management software has broad overlap with structured collaboration software, in that both provide a framework which organizes and streamlines meetings. Both offer features like document sharing, polling, agenda note-taking, and meeting note-taking. However, structured collaboration tools are intended for generalized usage, whereas board management software is tailored specifically for executives and board members. Employee Intranet — The online portal and document sharing components of board management software are also found in employee intranet software. Some board management tools may even provide communication features akin to those found in employee intranet solutions. Employee intranet and board management software differs in their intended use case, with the former being employed by an entire workforce and the latter only serving the highest levels of a company. Hi there! Can I help you find the best Board Management solutions?